Some of you know Kitty Angels as an "Adoption Agency" because of the hundreds of cats that we place into loving homes each year. When attending our adoption clinics at PETsMART in Nashua, we often see the friendly and familiar faces of previous adopters, who stop by and give us updates on their cats. These people know us as the "Cat Adoption People". Some of you know Kitty Angels as the "Feral Caregivers" that came into your neighborhood and humanely trapped, neutered (or spayed), vaccinated, and returned the feral cats living there, in hopes of providing a humane solution to the ever growing feline overpopulation. You may have heard of this kinder, "no kill", solution referred to as TNR, or Trap, Neuter, Return. Some of you know Kitty Angels as the "Rescue Group" that has searched burned out houses, crawled through drainpipes and under trailers, and camped out all night in our cars, looked for a gravely injured cat or kitten. You may have seen our web site or read some of our stories about the miraculous cats and kittens that we have rescued, many of which have beat all odds and have found wonderful, heavenly homes. Not many of you know of Kitty Angels as the no-kill shelter that also serves as a "Lifelong Sanctuary" for the many, many cats that we have rescued that will never be adopted. Because of their timid nature, or extensive medical conditions, these cats will live within the shelter "network" until their little bodies are ready for their final rest. Many of these cats have been with us for eight or more years. These are the cats that find their home in the homes of their foster family. In their Kitty Angels foster home they will be loved, fed and cared for, for the rest of their natural lives. As volunteers who care for many of these wonderful, but forgotten cats, we worry daily about how the shelter can continually care for these permanent resident cats, five, ten, fifteen years down the road. Some of these cats are handicapped, have permanent medical conditions, or are painfully shy and misunderstood. Some have lived in the Kitty Angels network since they had been rescued. Some had been returned to the shelter because they developed a medical condition or because they are "too shy". Some are with us because their owners simply "don't want to be a pet owner" any longer. When we take a cat into our network, we make a lifelong commitment to that cat, whether it finds a home immediately, never finds a home, or is returned to us for whatever reason. If the cat never finds a home outside of our organization, he or she always has a home with us. 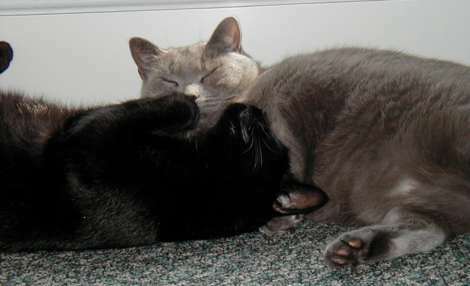 We have set up a special fund for our hospice cats. We call it the Scout Fund, in honor of Scout, who has been with us for almost nine years. Scout, whose photo appears in the background of this page, was found eating frozen trash outside of a fast food drive up window. When he arrived at our vet's office, he was wounded and scarred, had broken canine teeth, and limped on his badly healed broken front leg. Over the course of several years, Scout learned to trust his foster family and is the most well behaved boy that ever lived. He resides in his foster home where he is treated for a recurring medical condition. Please consider making a donation to this special fund. "Every life should have nine cats"
Unfortunately, no humane organization, despite everyone's best efforts, will be able to rescue all the cats and kittens throughout the area that are left to fend for themselves during the bitter cold months. There are simply too many homeless cats and not enough shelter space to accommodate them. Attract animals to use garages, basements, sheds, barns, doghouses, porches and other specially-built structures, which offer protection from the elements. Make sure each place is as insulated, warm and dry as possible. Provide bedding in enclosed sturdy boxes, using straw, heavy woolen or flannel blankets. Place food and water nearby. Feed as abundantly and as often as possible as food and water tend to freeze. Double the amount of food you usually give because extra food will help the animal fight the cold and keep healthier. Use better cat food brands, use dry as well as wet food. If there are kittens in the area, try to capture them and find a foster home for them. If you need to borrow a trap, call or e-mail Kitty Angels and we will try and lend one to you. Pay special attention to older or weaker animals. If they look sick they may need to be taken to a vet for medical care. 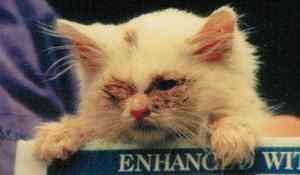 Never release a sick cat outdoors immediately following treatment, because it is likely that it will not survive. If you have a special room or space in your house try using it to foster an animal. It may mean life or death until spring arrives. If a female appears pregnant, she should be spayed as soon as possible to avoid the birth of kittens in the cold months (February, March and even April) as they would never survive. Never release an animal right after surgery as they may freeze to death. They need a few days to recover, especially females. If you know of an area with strays please find a number of people who will work with you on a daily feeding schedule. Food and water are ESSENTIAL IN THE WINTER! If you find yourself in a particularly difficult situation please email or call us as we may able to provide some advice to lead you in the right direction. Remember, YOU can make a big difference this winter for the homeless cats in your area! The animals are counting on you for your help. Note: Thank you to Annamarie Taylor of Animal Umbrella for allowing us to reprint this article. Kitty Angels is a no-kill shelter dedicated to rescuing stray and abandoned cats, furnishing them with treatment for injuries or other health problems, and placing them into life-long, loving, permanently indoor homes with compatible owners. We take all necessary steps to ensure the well being of our cats, including screening for infectious diseases, spaying and neutering, and providing rabies, distemper and other necessary vaccinations. We take in and place hundreds of cats each year and deal with many feral cat populations throughout eastern Massachusetts and southern New Hampshire. All of Kitty Angels' work is accomplished by a network of dedicated, unpaid, volunteers who care for the animals in the shelter facilities; do round-the-clock trapping and field work associated with the control and well-being of feral cat colonies throughout the area; and act as foster care givers for cats and kittens that are sick, unadoptable or otherwise in need of special care and attention. The vast majority of the cats in our care are the very neediest of animals, such as strays or feral (wild) cats, many of which are in urgent need of medical treatment. As a general policy, Kitty Angels sets no limits on the amount of veterinary care which it will provide to a sick or injured cat to return it to a state of good health prior to placing it in a good home. 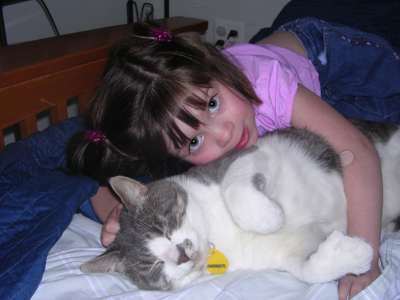 Kitty Angels placed over 600 cats into lifelong, loving, homes last year. We are 100% dependent upon adoption fees and the tax-deductible donations of individuals and organizations. For us to continue our work we are in constant need of life-long, indoor, homes and the financial support of generous and caring people. Please contact us if you would like to adopt a cat or if you are able to make a donation. "That best portion of a good man's life, his little, nameless, unremembered acts of kindness and of love." Kitty Angels is a true "Rescue Organization": our special "niche" is rescuing those poor hopeless cats that have come to the end of their rope and run out of chances -- the ones who are living outside, on the city streets, beside the highway, in fields and woods, struggling to survive. Below are just a few of our success stories. We hope you enjoy reading them as much as we enjoy telling them! These are just a few of the stories that are made possible by your support and donations. Thank you!!!! Kindred spirit Laura Burns called us when she found these lost souls living in Boston on a small strip of land between Route 93 and the train tracks near South Station. A very dirty but kind male stray was caring for a single young kitten, which shadowed her big best friend just like a kitten would shadow its mother. 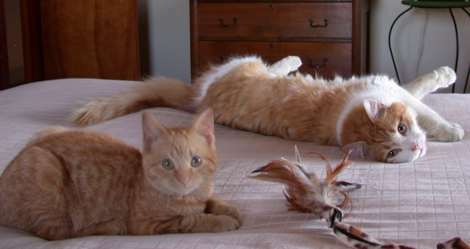 We decided that the two should be placed for adoption together, hence the story of Admiral and Ginger. Ginger says: "Admiral is a great father and my protector. I'm lucky to have him by my side for the rest of my life. But there are other desperately needy cats and kittens out there -- dodging cars on busy highways, trying to get food and maybe even taking care of a little kitten they love. This is a picture of us, cleaned up and enjoying the comforts and securities of a real home. Please help give other kitties like me and my best friend the chance of having a loving and heavenly home like ours." Marie writes, "As you may remember, we adopted Q-Tip for my daughter after she recovered from her 3rd open heart surgery. As we hoped, he helped her shake off a depression that a two week hospitalization can bring to a four year old. The two of them became fast friends...She loves to have him snuggle up as we read the bedtime stories for the night. Picture it....he's snuggled in between the two of us, listening contently to each page. His mild temperament is a perfect match for our loving and creative daughter. .Anna is happy to fill his quota of snuggles. If she could figure out how to purr, I think she would! Anna proudly tells anyone who will listen about how Q-Tip lived on the streets before we rescued him. She knows that they have a connection through their ability to beat the odds and survive! "Thank you from a mom who wondered if she'd ever hear her daughter's laughter again." Many of you remember our plea for help a couple of years ago, when we learned that Chili Mom had a condition in her legs that had rapidly progressed to the point that could no longer stand on her back legs. We were told that we only had two options: put her to sleep or agree to a very expensive and complex surgical procedure that could only be performed by a Board Certified Orthopedic Surgeon. The estimated cost was $1,800.00, and because of the overwhelming record volume of cats and kittens that Kitty Angels had taken in that year, we did not have the funds on hand to cover her much needed surgery. Thankfully, your generous donations gave her the chance she needed. Her new family writes: "Mina (Chili Mom) is doing fantastic...She welcomes all pats and even seeks them out now .... She spends half her day prancing around showing off for Harley, the love of her life, and sprinting laps with the girls (Kitty and Chilly) during play time. She can really move for a cat that had such drastic surgery....She is just absolutely adorable, and now spoiled rotten." "Adopt the pace of nature." It has taken me a few years to even begin to be able to articulate the events that sent Benny to our shelter. As a teacher, it is strictly taboo to take personal phone calls during the day -- but the person calling that day was insistent that a message be conveyed to me to call them as soon as possible. Many people knew of my involvement with Kitty Angels and also knew where I worked, so I would occasionally receive a call of this kind. When I returned the call, the tale that I heard rendered me speechless. An elementary school age child had put a ten-week-old kitten in a microwave oven the day before and turned the oven on. The kitten was showing visible signs of trauma: his ears were deformed, his feet were burned and he was in terrible pain. I told the caller that Kitty Angels would accept responsibility for the kitten and arranged for him to be transported to our veterinarian right away. The kitten was hospitalized. Since it could never be determined how long the kitten was in the microwave, we had no idea what internal damage had been done. The vet did not know if Benny would survive. The terrible waiting game began as the staff at the veterinary hospital did all that they could to make Benny as comfortable as possible. During this difficult time I thought about how I might assure that, if he lived, nothing else terrible would ever happen to Benny again. What safe haven could we provide for him after surviving such a hideous event? I thought of a shelter volunteer that I greatly admired for her dedication to animals and her gentle ways. I hoped that she might open her home and heart to nurse yet another helpless waif. When I called her I had trouble even explaining the situation through my tears. Luckily for Benny, Linda agreed to foster and care for him if he lived. It was a tense few weeks of hospitalization, but he survived with relatively few scars and still resides in the best of places - Linda's house. This article is dedicated specifically to her and to the many other volunteers who care for the neediest of cats on a daily basis in their homes. Many of you reading this have directly helped with cats like Benny through your generous donations. We are often the last resort for cats like Benny; without your donations we could not provide the help that they so urgently need to survive. Kitty Angels' accomplishments are the result of the combined efforts of a great many people and supporters. We don't have space to list them all, but we would like to acknowledge some of them. First, a very special thanks to all of you who have opened your hearts and homes to animals and to those who have donated in some way to help us or others who act in concert with our cause. You are the ones whose caring, kindness and generosity makes the difference. We couldn't do what we do without your continued support. Thanks to our team of dedicated volunteers and foster home caregivers. These are the people on the front lines, whose dedication and tireless efforts have brought so many needy animals back from the brink. They're the ones who trap the strays and ferals, take cats to and from the vet, feed and house them, change dressings on wounds, administer medications, clean cages and litter boxes, feed and maintain feral populations in all kinds of weather, work on weekend adoption days, answer e-mail and so very much more -- all without any remuneration of any kind. Thanks also to Roberta Carabba who creates and knits the wonderful handmade blankets, cat toys and other craft items that she donates to us and that we sell at adoption days. And, thanks to PETsMART for providing us with first class space in their store in the Royal Ridge Mall in Nashua, NH. You can see some of our adoptable cats in the cages at the front of the store and you can see us there on weekend adoption days. Thanks, also to Especially for Pets for allowing us to show adoptable cats and have adoption information days at their stores. And, thanks to the management and staff of both stores for being so very kind and supportive for so many years.